Главная » Blog "by MARIE"
I remembered that I have captured video on a computer, I decided to mount it so that it would not be wasted ... Also, I shot a video - a review about this sweater, in which I show and tell how it looks now, from which yarn He knitted, what needles and others. What about yarn - it is still preserved not quite badly (I was knitting from Angora de Luxe), but there is thorniness. On this, if you have a very delicate skin - then I would advise you to replace the yarn with a softer one. If you want to keep "shaggy", then you can take a real angora, although it will cost much more expensive, unlike the Turkish mohair!) But also this sweater will look nice from merino wool or even from cotton - a summer option. Although I am personally satisfied with the version of the mohair! Well, it tingles a little, well, but it's warmer in it, and I'm not cold!)) In general, in the video review, I also talk about what I knitted with smaller needles than the yarn manufacturer suggests. For this reason, this could be the cause of pricklyness. 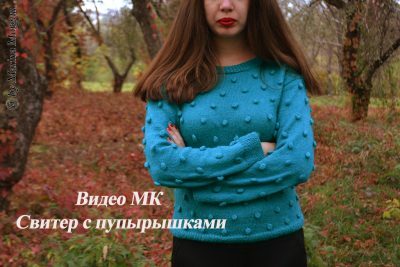 This entry was posted in Blog "by MARIE", Master Class, Pullovers, cardigans and sweaters and tagged Angora de Luxe, youtube, вяжем спицами, knitting, как связать свитер, sweater knitting, Master Class, пуловер спицами, свитер из мохера, свитер с пупырышками, стильное вязание, уроки вязания by by Marina Morgun. Bookmark the permalink.